The U.S. scrum collapses for the third time and South Africa is awarded a penalty try. 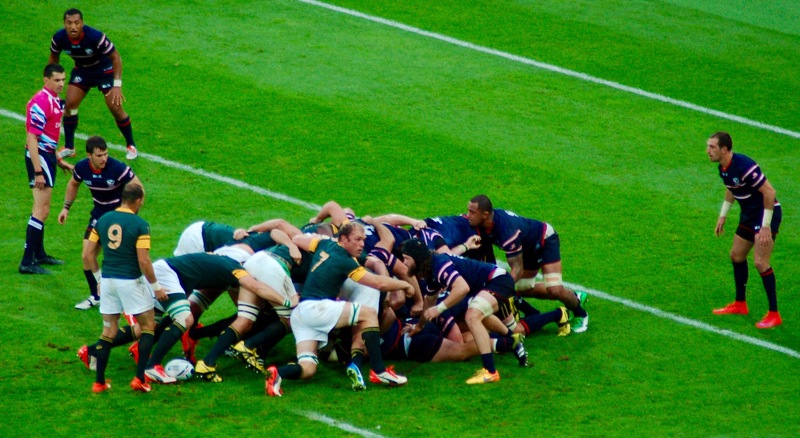 The South African scrum, especially in the set play, showed their strength over the U.S. forwards and took a 14-0 halftime lead, including a penalty try awarded after three collapsed scrums by the U.S. just outside their try line. The South Africans scored seven minutes into the match. The Springboks set up a rolling maul after a lineout and drew an offsides penalty from the U.S. They took the quick penalty and broke through a scattered and surprised backline defense by the U.S. Damian de Allende touched down for the South African try and Handre Pollard added the two conversion points. The penalty try came almost a half hour into the game as the Springboks drove down to the five-yard mark and were awarded a scrum. Three times South Africa won the hook and held the ball at the feet of the No. 8. On the third collapse the referee awarded the penalty try (it would have been scored if there had no been an infraction) and Pollard converted. Posted on October 7, 2015 by jbsaulPosted in RugbyTagged rugby, South Africa, USA Eagles.